Welcome to my website. I’m Russ MacMillan and I recently invented a product that really helps sufferers of Sleep Apnea and Snoring, two problems that are related in several ways. To understand the benefits of my Ultimate Chin Strap (UCS), I want to take a moment to tell you about the problems that The UCS solves. 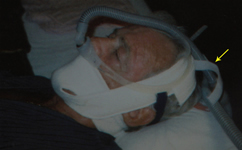 Sleep Apnea is receiving major attention now, as a long-term condition with severe risks to health. An “Apnea” occurs when a person stops breathing for ten or more seconds – usually during sleep. For most people, the body struggles to regain breathing, usually causing the person to waken without memory of the event. Over time, the loss of normal heart and lung functions, plus brain synchronicity and body health, can lead to a variety of deadly disorders, including atrial fibrillation, heart muscle damage, and stroke. Research has shown that falling into a deep, uninterrupted (REM) sleep reduces the risk of heart failure, strokes, chronic fatigue, memory problems, and other major health issues. Sleep Apnea and Snoring decrease the body’s ability to fall into a deep sleep and get the proper, healthy REM sleep needed for healing and rejuvenation. Many people snore while sleeping. Mouth snoring accounts for the vast majority of sufferers. This condition is caused by the same factors that produce Obstructed Sleep Apnea (OSA), the most common form, which results from open-mouth breathing during sleep. Snorers also are at risk for health problems, in addition to possible relationship impacts. Snoring is often an early sign of Sleep Apnea. After snoring for many years, I was recently diagnosed with Sleep Apnea. I opted for CPAP therapy – that’s “Continuous Positive Airway Pressure”. It consists of a small air machine with a tube and a mask that an Apnea sufferer wears at night while sleeping. The CPAP machine provides pressurized air, which prevents the obstruction from forming while breathing. CPAP allows sufferers to sleep deeply all night and awaken refreshed. Along with the machine, most CPAP systems come with a chinstrap – a device to close the jaw and hold it closed all night. But these devices do not prevent breathing through the mouth, which defeats the purpose of a nasal CPAP system. They also allow snoring through the mouth. So I invented The Ultimate Chin Strap to solve this problem. It comfortably closes both the jaw and the mouth, to allow nasal breathing all night with no air leakage through the mouth. If needed, the sleeper can draw in air through the UCS, but it comfortably and effectively reduces mouth breathing and the resulting problems. In addition, The UCS Chinstrap will essentially re-train muscles to maintain proper jaw alignment and sleep with the mouth closed. I also designed a UCS for snorers. Unlike the mouth being completely covered, as with the strap for CPAP users, I modified this strap to leave an opening around the mouth, to prevent any claustrophobic feelings and allow the freedom to breathe through the mouth if desired. THE ULTIMATE CHIN STRAP REALLY WORKS! Hundreds of my customers have reported impressive results! The Ultimate Chin Straps are American-made, patented, and unique, as no other accessory is similar in design. My Ultimate Chin Strap is made of a soft knit polyester blend that is lightweight, cool to wear and easily washed. Each Ultimate Chin Strap is hand cut and hand sewn. The Velcro closures are easily used and will not irritate hair or skin. Although this chin strap conforms well to the face and chin, donning a chin strap or any apparatus on the face is not natural and involves several days to acclimate. However, the end result is one that you are seeking and the “getting use to period” will resolve in a matter of days. I also have a memory foam pillow available for purchase if you do not already have one. This pillow prevents the head from sinking down, which will hinder the effects of the CPAP machine. I have made this pillow cost effective vs. others on the market. The size of this pillow (12” x 15”) is convenient for those who travel. thinking about improvement to one’s sleep while using breathing machine. sleeping without having to constantly be adjusted or moved. • So, if you are a snorer, buy my UCS for Snoring and start reversing the harmful effects of years of poor sleep quality. • If you are scheduled to be tested for Sleep Apnea, buy my UCS for Apnea first and take it with you, for a meaningful CPAP titration at lower pressures. • If you already have a CPAP machine, do yourself a favor and order my UCS chin strap. See how well CPAP can work with the right product. I guarantee my chin straps with a money back offer for 30 days after buying it. I thank you for the opportunity to share my unique, successful story with you. I’m excited and looking forward to satisfying many others who want to resolve their Snoring and Sleep Apnea issues.